Tram routes 3 and 9 will be diverted on the night of Monday 19/Tuesday 20 September from midnight until the end of service. Tram 3 will run in the direction of Kaivopuisto via Helsinginkatu. 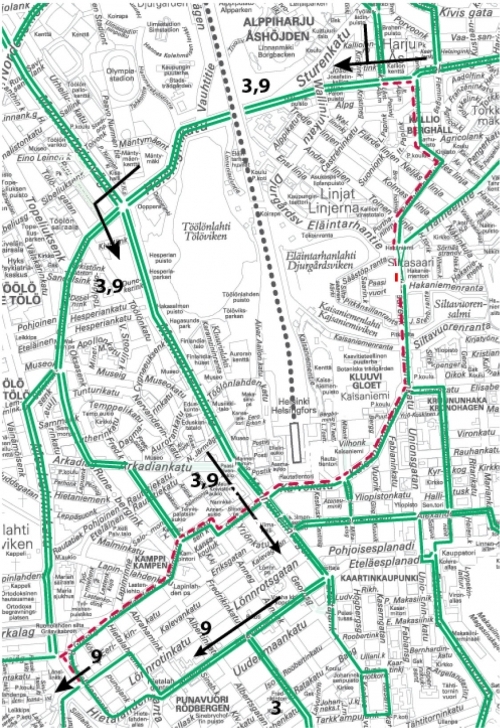 The tram will not serve the section of route between Kallio and Kaivokatu. Tram 9 will run in the direction of the West Terminal (Länsiterminaali) along Helsinginkatu, Mannerheimintie, Bulevardi and Kalevankatu. The tram will not serve the section of route from Kallio via Kaivokatu and Kamppi to Ruoholahdenkatu. The diversion is due to track work.